A free amino acid found in mammalian tissues exerts variety of biological action. It shows effectiveness against diabetes mallitus,insulin resistance and its complications. Supplementation of Taurine improves carbohydrate metabolism and decreases triglycerides. Exhibits beneficial effects on endothelial dysfunction in type 1 diabetes patients. A nutritional supplement used sa a nephro productive agent. Protects patients with moderate chronic renal insufficiency. It not only exhibits antioxidant agents but it may also countract the glycation cascade thriving the inhibition of oxidation. Inhibits reactive oxygen species & protects cells from glucose induced inhibition if proliferation. Glomerular damage in diabetes can be prevented or atleast attenuated by supplementary with Bioneph. 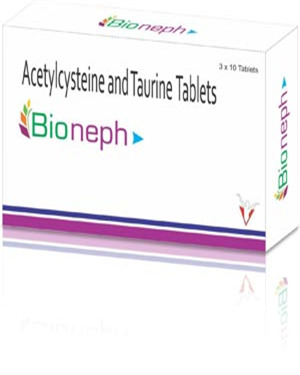 Taurine in combination with acetylcysteine is useful in attenutring UACR (Urinary Albumin Creatinine Ratio) levels in microalbuminuric type 2 diabetes patients. Exhibits benefits kidney function and blood pressure of diabetic patients. Significantly suppresses increase in urinary protein secretion in diabetes. Retards development of nephropathy in depend diabetic patients.